It seems that this is to be the last in Tiberghien’s Bartόk series. I thought very highly of the two previous issues (Volume 1 ~ Volume 2) so it would appear that Tiberghien is not setting himself up in rivalry with the late Zoltan Kocsis’s complete cycle which remains the benchmark for Bartόk’s piano works (Philips 47567 or Decca 4782364 or individual issues from Presto). Not that he would have anything to fear from the comparison: he just has a slightly different view of the composer, emphasizing his impressionist rather than his percussive side and taking every opportunity to vary the tone and colours he uses. I was very keen to hear what he would make of the Piano Sonata, Bartόk’s principal work for solo piano. This dates from 1926 and so comes from right in the centre of the composer’s most percussive period. I hadn’t really thought that Tiberghien would pull his punches in this challenging and confrontational work and nor does he. In the first movement he emphasizes its explosive energy rather than its implacable momentum, allowing the sforzandi crashes in the left hand to disrupt the tempo very slightly which increases the tension in an already strenuous piece. The slow movement is gaunt and grey. The last movement is folkloric without using actual folk tunes. Tiberghien’s view of this is somewhat severe and unsmiling but I think this is right – or least he convinces me that this is a legitimate way to interpret the work. I was very impressed by his interpretation and immediately listened to it again. We then have a series of shorter and less formidable works. The Hungarian Folksongs, Sonatina and Three Rondos are all based on folk music. The individual numbers are all short and attractive. The Sonatina is particularly successful and indeed Bartόk later orchestrated it under the title Transylvanian Dances. Tiberghien plays all these with same easy charm and grace as in his previous Bartόk recitals. The Études, however, are sterner stuff. These are highly chromatic, complex pieces. The first features rapid figuration interspersed with leaps and sudden outbursts. The second has a texture rather like that of Ravel’s ‘Ondine’, from Gaspard de la Nuit, with a melody gradually emerging from waves of arpeggios. However, the harmony suggests not so much Ravel as Scriabin. The final study is the most advanced of all, with complex polyrhythms and irregular accents. This sounds like an anticipation of one of Ligeti’s studies. I am not sure that these studies are complete successes artistically but they are fascinating and also suggest other directions which Bartόk might have taken. Tiberghien lays out their mysteries with admirable clarity. The Sonata for two pianos and percussion dates from Bartόk’s later years and is one of the most impressive of his chamber works. The unusual scoring has militated against its frequent performance but there are many recordings. The percussion required is three timpani, two side drums (one without snares), xylophone, cymbals (two kinds), bass drum triangle and tam tam. Two players are required for these. The most important in this work are the timpani, which are sometimes required to perform glissandi, an eerie sound, and the xylophone, which is used much as in the Music for Strings to bring out the top line. Bartόk had long been interested in percussion and this work, together with the Music for Strings, Percussion and Celesta, written in the previous year, mark the climax of this interest. The three movements move from a brooding opening featuring tritones, again as in the Music for Strings, to a joyous finale with many changes of mood between. By the way, he later orchestrated this work as a Concerto, but this was really to provide a vehicle for his wife; the original version is to be preferred. Tiberghien and François-Frédéric Guy have clearly taken considerable pains to match their tone and style, very necessary as they sometimes play the same material or toss it from one to the other. They are each masters of both refinement and power. They bring a good deal of variety to the long first movement and in the second, a kind of Bartόkian night music, they are haunting. The finale brings a welcome note of gaiety to a work which as a whole is rather sombre. Colin Currie and Sam Walton do the honours on the percussion crisply and with vigour. The recording is as clear as in the previous recitals and particular care has obviously been taken in the careful balancing of the two pianos with the percussion in the closing Sonata. There is a photograph of the set-up for this in the booklet. I am pleased to say that it matches what Bartόk set out in his score. Apart from discussing the works in chronological order rather than the order on the disc the notes are full and helpful; they are also provided in French and German. There is no direct rival for this programme. I have already mentioned Zoltan Kocsis’s Bartόk series and Tiberghien provides a valid alternative for those works he chooses. I should also mention the late Paul Jacobs’s remarkable recital of twentieth century piano studies including the Bartόk Études and studies by Stravinsky and Messiaen along with Busoni’s piano sonatinas (not little works at all), originally on Nonesuch and now on Arbiter 124. 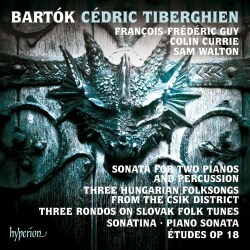 He makes the Bartόk Études sound even more modernistic than Tiberghien, thanks to a slightly drier touch. For the Sonata for two pianos and percussion the reference version has long been the 1977 one with Martha Argerich and Stephen Kovacevich as the pianists, now on Decca 4782467 (review), though there are many other recordings including some later ones involving Argerich. I can’t say that Tiberghien and his team surpass that supremely atmospheric and sometimes frenetically exciting version but they stand up well alongside it and the disc rounds off an excellent series.